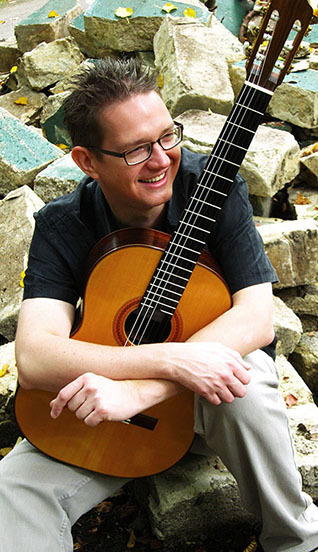 Michael started playing the classical guitar at age 11 after his family moved to Poole on the south coast of England and to his parents surprise he was pretty good. Four years later he won a scholarship to attend the Guildhall School of Music & Drama, studying with Michael Edmonds and Robert Brightmore. After graduating he continued his guitar studies with John Mills at the Royal Welsh College of Music & Drama concurrently studying music technology with Roger Butler and Leif Keane. Over the years he has participated in masterclasses with John Williams, Nigel North, David Russell, Paul Galbraith, Xuefei Yang, Fabio Zanon, Ben Verdery and Andrew York amongst many others. Whilst in London, Michael became one of only a handful of guitarists to reach the String Semi-Finals of the BBC Young Musician of the Year Competition and performed on BBC 1, BBC 2 and ITV. During his time in Wales he played live on BBC Radio Wales, S4C and was featured in the BBC Radio Two Young Musicians’ Series.